From dedication by our team management the event was planned weeks in advance. From invites with location, the program, and the party organization- nothing was omitted. Even the technical part of the team was required – there were many stressful moments ensuring the car was ready on the 9th. Working around the clock we never got into a bad mood, working towards the common goal of seeing the eCar assembled for the first time gave us the motivation we needed. On the night of the 7th to the 8th at four in the morning, we had a finished car. Directly after, the rollout video still was shot and edited. In the morning we then gathered the entire team to prepare the casino. Everyone was pleased to present the car to the sponsors, friends, and family. The GFR 16e was safely loaded onto the stage alongside his siblings, 15e and 14e. The event started at 5pm. Two team members from management led the guests through the evening and welcomed the faculty advisor and rector Professor Dr. Herbert Dreher as well as Udo Zuck of Adam Opel AG for a few words to welcome them to the stage. American team members were not left out, included was a short video message directly from the test track. 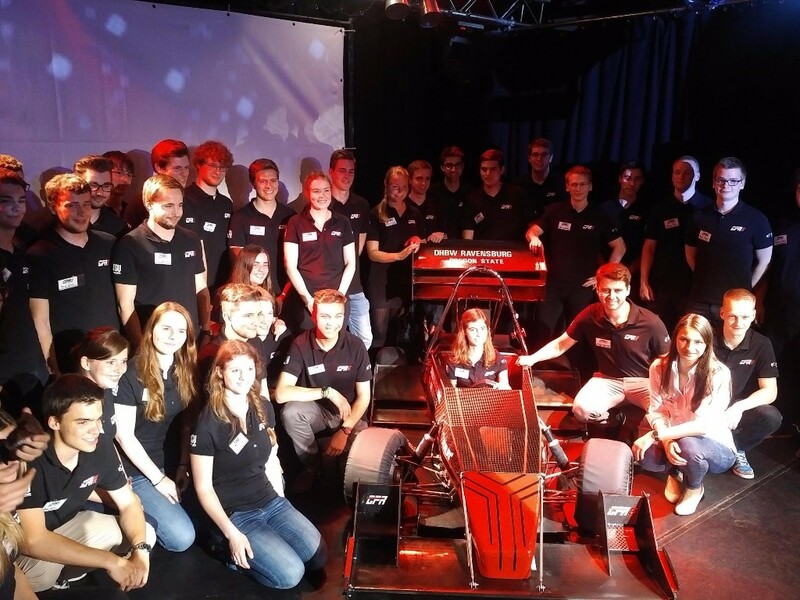 This was followed by an interview with our electrical lead, Svenja Hillebrand and our mechanical lead Philipp Kreppenhoffer, who reported on the developmental process and the improvements on this years car. Especially with the new battery case made of carbon fiber saving a lot of weight this year. In other cell types and a new cooling method, we hope to significantly provide more reliable battery power. Furthermore, a new undertray for added downforce. Finally, there was a view of our goals for this season: We obviously want to build on the results of last year! After the presentation and the completion of the rollout video the wait was finally over, the cloth was pulled off our new car and it was revealed. All the visitors got the opportunity to approach the car and get a close up view of the new features. In addition to the technical features of GFR16e, it also has a new design: unlike GFR16c, it has red lines but mirrors the new “Tron” livery pattern, giving our cars a whole new look. After some time, the event shifted and we headed back to DHBW where we ended the evening with a spectacular after party. We would like to thank once again all who came to the event, you made it a very memorable evening for us all! Without our sponsors and supporters like you we cannot have great events like this. We hope that you got to get a better view of our team and enjoyed the event with us.